THE STORY - Jake Pentecost is a once-promising Jaeger pilot whose legendary father gave his life to secure humanity's victory against the monstrous Kaiju. Jake has since abandoned his training only to become caught up in a criminal underworld. But when an even more unstoppable threat is unleashed to tear through cities and bring the world to its knees, Jake is given one last chance by his estranged sister, Mako Mori, to live up to his father's legacy. ​Robots are tasked to fight monsters yet again in “Pacific Rim Uprising,” following Guillermo del Toro’s “Pacific Rim.” This time around, del Toro is only producing. Steven S. DeKnight instead directs the film, making this his feature directing debut. The draw to this movie is pretty straightforward: bombastic, over-the-top action featuring giant robots fighting crazy blue monsters. If that’s not an immediate draw for you, feel free to tune out now. There’s nothing else here for you. 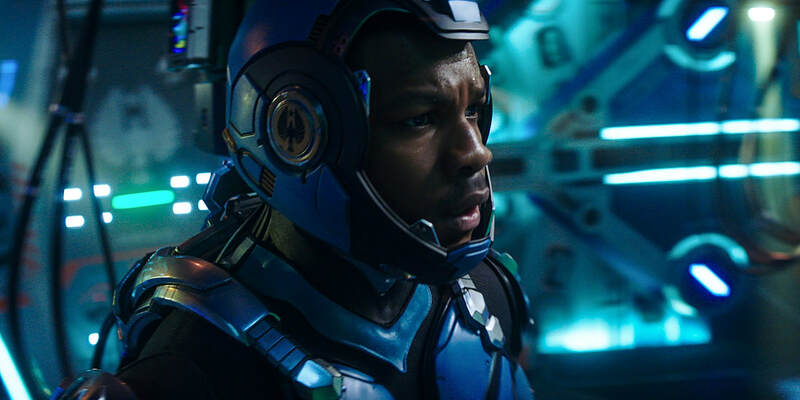 Though he’s not given much to work with, Boyega’s charisma is a bright spot in the film. He’s clearly having fun with the role, which does help quite a bit. Inevitably, these two are arrested, and rather than be sent to jail, they’re sent to the Defense Corps. Jake is tasked to train new Jaeger pilots, and Amara is one of those new pilots. Exposition is laid on so heavily throughout much of this film that it’s painful. Any time a new character shows up, the other characters describe their backstory, their demeanor, and anything else you might want to know. So much of this movie is explained rather than shown to the audience. It doesn’t make much sense because the story isn’t even very interesting even after it’s explained. As an inexplicably ominous new drone program is set to begin, a rogue Jaeger attacks a city. The film actually gives a potentially interesting arc to Charlie Day’s character, Dr. Newt Geiszler, but it’s squandered. No motivation or deeper ideas are explored. Things just happen so that we can see more destruction. Eventually, as one might expect, the Kaiju find a way to break through once again. By the way, things seem to happen very fast in this movie. Have an idea of a game-changing new rocket system that could save humanity? Great! Whip it up in the next couple hours. Never piloted a Jaeger before? No problem! You can get the hang of it in a few minutes. This ease got old pretty quick. It becomes harder and harder to see the difference between this and the latest "Transformers" film as the robots destroy city after city after city. While the first “Pacific Rim” had plenty of insane action, there was a certain sense of style and awareness that elevated the work. Here, there’s nothing very special to speak of. The visual effects are fine but feel the same (If not worse) than the first film from five years ago. The cinematography is fine but feels like cookie-cutter sci-fi (Bright colors, lens flare and rotating pushes in). There’s absolutely nothing stylistically to set this film apart from other films within its genre. Don’t get me wrong, if you’re here mainly to watch robots faceoff against monsters, you’ll likely leave fairly satisfied. The movie delivers on that front. This can give you a quick blockbuster fix if that’s what you’re looking for. Still, there are plenty of better films that have crazy action and CGI destruction. “Pacific Rim Uprising” disappointingly settles for simply being passable.